To me one of the best things about Christmas is the excitement generated by anticipation for the big day itself. A Christmas Advent calendar is a great way to feed that excitement and anticipation. Every year I like to make the family’s Christmas advent calendar out of the stuff I already have. This year I decided to use old tin cans. At Christmas everyone has their own family traditions about the way the celebrate the big day. The same goes with advent calendars. Some advent calendars stop at the 24th others go to the 25th. Some have a daily treat others just a picture etc. 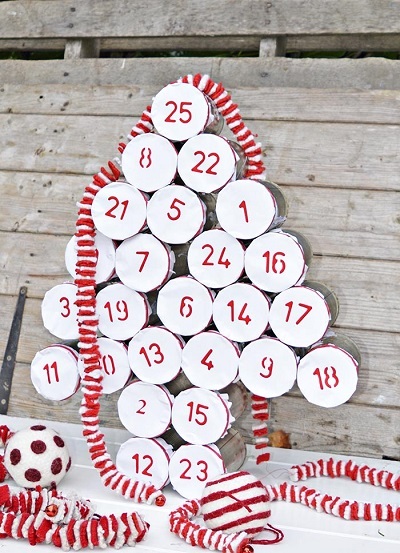 See this fun upcycled tin can advent calendar DIY! With my advent calendars I like to include a daily Christmas chocolate treat and I use old Christmas cards for the pictures and write cheesy Christmas jokes on the back. I’m a sucker for big smiles from my boys and if the advent calendar treat doesn’t do it well hopefully the cheesy joke will make them grin. A collection of cheesy Christmas jokes, there is a link on my blog for the fifty of the best. Have good old-fashioned fun with homemade Pick Up Sticks! A wonderful party activity or gift for kids or adults. The tutorial shows how to make a solid or striped set with the perfect sized carry pouch and a printable instruction sheet! ….see the rest on Claire’s blog! If you like this project, you might be interested in our Christmas DIY’S! <====== click this link! Are you interested in submitting your own DIY projects such as sewing, crochet, quilting, recipes or other helpful do-it-yourself tips? Hop over HERE to submit your projects! I hope you will enjoy using this tutorial and would like to invite you to subscribe to my posts!